Achieve impressive printing results—page after page. Original HP toner cartridges consistently deliver documents with crisp text and sharp images. Make managing and replacing supplies simple, so your office can stay productive. 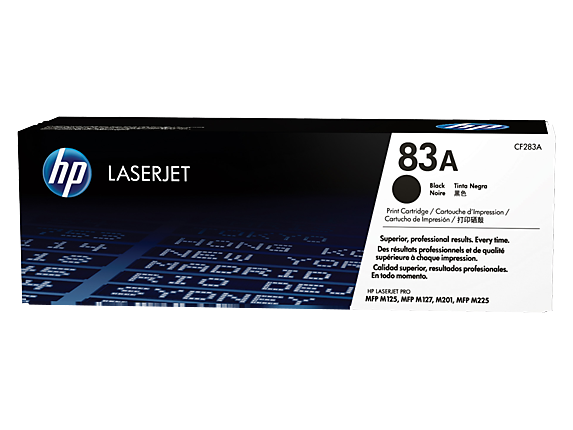 HP 83A Black LaserJet Toner Cartridge. Rely on peak performance. Original HP toners are designed to perform in challenging environmental conditions. Get quality prints time after time – from Original HP toner cartridges. Avoid the reprints, wasted supplies, and costly delays. Trust Original HP toner cartridges for consistent, uninterrupted printing that keeps you on your business tasks and on budget. Don’t miss a beat. Replace Original HP toner cartridges in seconds, and get back to printing. They’re specifically designed for your HP LaserJet printer or MFP – with the toner and imaging drum in one easy-to-install supply.